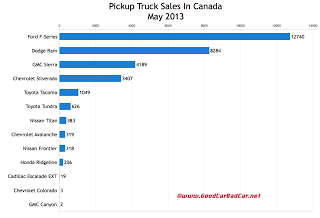 Canada’s auto industry sold 9300 more vehicles in May 2013 than in May 2012. The truck market alone was worth an extra 2662 sales. Ford’s F-Series alone was worth 1775 extra sales, and the Ram Pickup brought in 1544 more buyers. The Ford Ranger is dead, as is the Dodge Dakota. You won’t find the Chevrolet Colorado and GMC Canyon to be the best of contributors as we wait… and wait… and wait for their replacements. This comes amid news today that Reid Bigland, the boss at Ram Trucks, doesn’t see a future for a Dakota replacement. And how do you not believe a guy with the name Bigland? He basically sounds like a special edition Ram. Outdoorsman, Tradesman, Big Horn, Laramie, and Big Land. Sounds about right. Canada’s truck market rose 9.2% in May and is up 9.3% so far this year. That’s quite clearly better than the 5.4% gain posted by the overall new vehicle market in May, and the industry’s 2.4% improvement through the first five months of 2013. Desrosiers says passenger car sales rose just 2.4% in May and are down 1.5% this year. We spent much of last evening touring around a small part of Nova Scotia’s Eastern Shore in a Ram 1500 Outdoorsman Crew Cab. The ability for our rear seat passengers to stretch their legs, the high feature content, the quiet interior, the long wheelbase-inspired ride quality, the smooth-shifting 8-speed automatic, and the sufficiently-powerful 3.6L Pentastar V6 are enough to convince me: trucks can be great family vehicles in 2013. We’ve yet to measure the actual fuel economy in this week’s test vehicle, but there’s no denying that the usual discounts advertised by truck manufacturers go a long way to making a $50,000 truck more affordable than a $50,000 car, as the charitable deductions go a long way to paying for fuel. 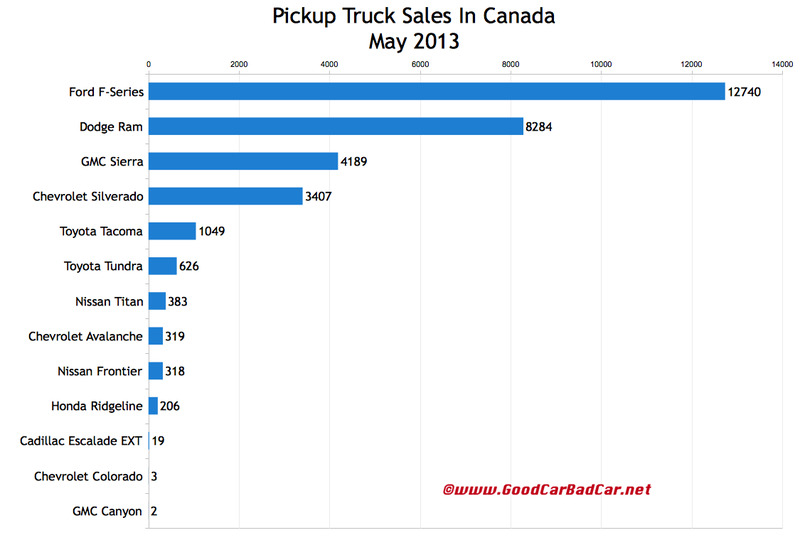 May 2013 was the best Ram Pickup sales month ever for Chrysler Canada. Individual buyers aren’t the only ones buying trucks, of course. Ford sold an all-time monthly record of 12,740 F-Series pickups in May. Some of those buyers – you might not believe this – actually throw stuff in the bed of their truck. You can click any model name in the table below to find historical monthly and yearly sales figures for both the United States and Canada. The best seller list below takes into account all trucks, and it’s been made sortable so you can rank trucks by year-to-date volume or year-over-year change or alphabetically. Best seller lists for cars and SUVs are coming up soon on GCBC. You can always find historical monthly and yearly sales figures for any vehicle by selecting a make and model at the Sales Stats page. Updated At 5:22 PM 06.10.2013 with corrected YTD Sierra figures and consequently slightly different overall numbers.